IAH Airport hotel appeals to Texas travelers and guests. The Staybridge Suites George Bush Intercontinental Hotel (IAH) offers the best service and value in the area. This extended-stay hotel in Houston, TX is near the George Bush Intercontinental Airport on the Sam Houston Parkway (Beltway 8) making your arrival to Texas easy and convenient. 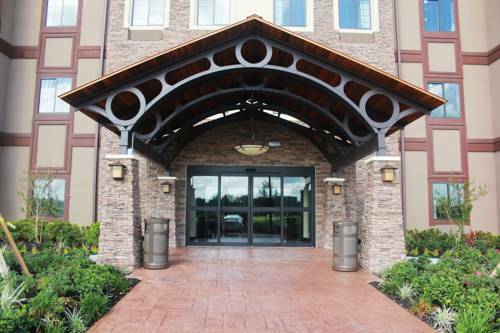 An excellent choice for business travel, Staybridge Suites Houston IAH Beltway 8 offers free airport shuttle. Our hotel is located near United Airlines, GE Oil and Gas, and the headquarters of Halliburton and Baker Hughes. Complimentary amenities like free Wi-Fi everywhere helps you stay productive during travel while The Social evening reception offers time for you to wind down and mingle with other guests. Youll enjoy the comforts of home during your visit at Staybridge Suites. Spacious one and two bedroom suites include a work desk and a fully-loaded kitchen equipped with a microwave, stove top, dishwasher and a full-size refrigerator. Other guest amenities include a free breakfast buffet, free laundry facilities and an on-site fitness center. Take a swim in the outdoor pool, have a drink on The Patio or visit The Den for some reading, movies and board games. Whether youre in Houston traveling for business or vacation, plan your next visit at this convenient airport Staybridge Suites hotel.